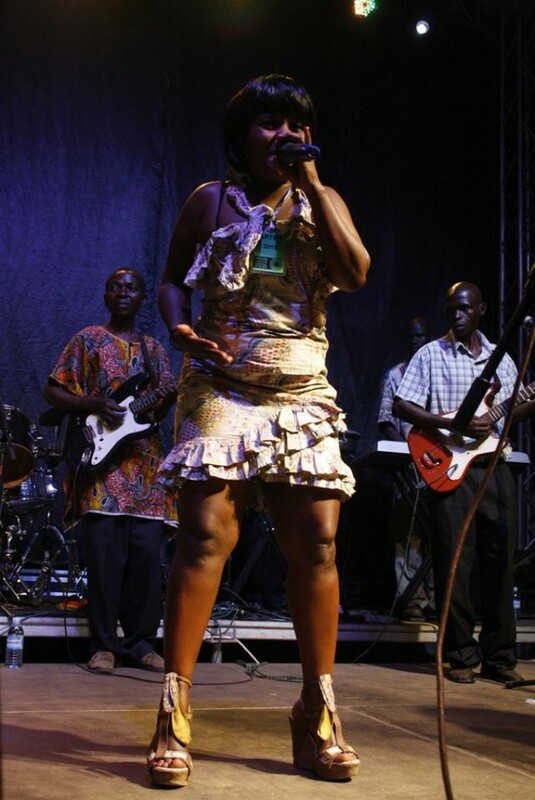 “In Mbale people love their own [artists],” Bayimba’s Head of Education, Rosette Nteyafas remarked midway into the evening stage performances at the Bayimba Eastern Regional Festival. Viewers clung close to the stage at Naboa Road, leaving food vendors and quiet revellers at the street bars behind them. “Last year when we had Idi Masaba and Cindy, the crowd pushed all the way up to the barricade.” Nteyafas remembered. The reduced numbers at the 2014 Eastern Regional drew a lot of comparison with previous festivals. This contrast could be made between last year’s performers and those of 2014, yet their disparity is not based on regional descent; rather, on popularity. Cindy and Idi Masaba are some of the finest musical exports from the region, their capacities transcend cultural barriers; a quality that was lacking on the performance log for the evening. Indeed, most of the acts showcased on the night are from the region but in relation to Cindy and Idi Masaba, are unknown. If the purpose of the Bayimba regional festivals is to expose the best of what localities produce, the Mbale eastern festival displayed largely unknown regional acts, who for their lack of distinction, couldn’t capitalise on regional loyalty to attract the numbers. Existing in an urban mix of cultures, Mbale town defies a simple cultural construction. The dominant population in the region is of Gishu descent, but the city is a blend of ethnicities and the influx of trade makes Luganda the most widely spoken urban language. Amidst the stream of influences, Mbale City is a culturally close imitation to Kampala; borrowing its broadness and also its perception of all things popular. Early in the afternoon, KLA ART 014, engaged the visual artists in a workshop that was defined by more enthusiasm than enterprise. Commenting on the meagre display of visual art in comparison to the other regions in the north and west, one of the specialists from Uganda Visual Artists and Designer’s Association (UVADA), Edward Wadimbwa said, “They love art, but the question is how to make it professional. Can you imagine there is no art gallery in Mbale? For most, what is considered art is making sign posts and t-shirts; canvas art is simply fun.” According to Ronnie Tindi another expert from UVADA, the visual artists in Mbale are isolated. 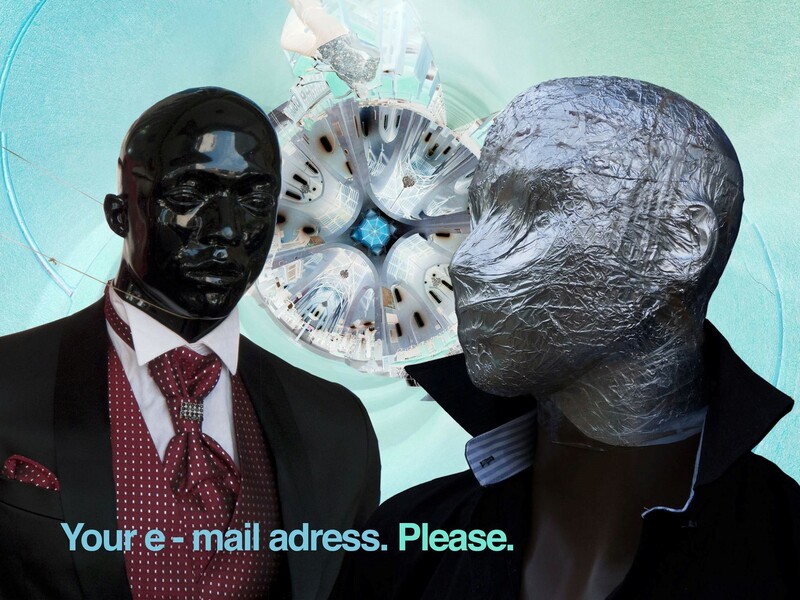 This reclusion limits opportunities among artists to share, support and impact each other’s ideas. The KLA ART interactive sessions in which the visual artists worked with festival goers to sculpt a fish along the length of a boda boda, attracted eager participants. Wadimbwa, who facilitated in the prior Bayimba regionals in Gulu, Jinja and Fort Portal noted that the enthusiasm expressed by the public was unprecedented, “The artists were not so captivating which means the public wasn’t intimidated. 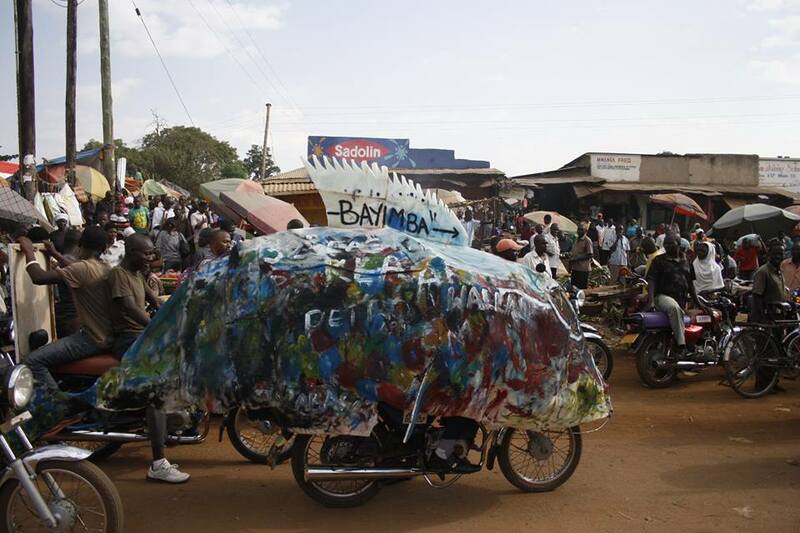 The idea of turning a boda boda into a sculpture was exciting for most of them. For the first time [on the festival circuit], all our paint got finished.” This industry of the public session later spilled onto the Mbale streets in the Unmapped mobile exhibition, attracted interest and curiosity for the strange procession of art-laden boda bodas trailing alongside the Mbale school brass band. Unlike the saturation of music performances which permits for broader choice, in Mbale, the sample space for visual art is relatively narrow which — if viewed proactively — offers an advantage to the artist. Mbale’s fascination for the unusual as shown in the mobile art exhibition was a sign that the visual artist must be ingenious in carving out new platforms; they must interact with their fellow artist to expand ideas; but most importantly, to must pick up their tools and work. Bivuga, a multi-ethnic cultural troupe, prioritised variety over distinction into a measly reception from the audience. Accompanied by an all-female dance troupe clad in national colours, Bivuga gave a musical tour of the country’s regions with reproductions of the Acholi, Bagishu and Baganda cultural dances. They had read the multi ethnic crowd well and their complimenting ace was the conversion of popular classics like Philly Bongole Lutaaya’s Diana and pickings of Oliver Mtukudzi into identical rhythms orchestrated by drums, endigidi, amadinda and the ngalabi. There appeared to be a lack of vigour as seen in the frontman who repeatedly switched his influences. It was clear he possessed the music, but the music did not possess him. The next performance was by a duo of comedians dressed in school attire: white short sleeves tucked in, bellies sagging over pairs of school khakis. The comic dress was well thought alongside their secondary school inspired jokes. However, their lengthy narratives betrayed an indulgent lack of subtlety and for most parts, their act loomed in spaces of redundancy. Skid Major-later joined by Mr. Brief-performed a blend of Japadhola and English songs set over a Trap Hip Hop sound. He offered crowd-pleasing choruses, particularly the catchy, It been a long time/ Its been a long time/ Like tourists we keep on moving. A Bayimba alumni from the 2011 Hip Hop workshops he seemed to borrow significantly the southern American Hip Hop sound that vocalises the failures and triumphs of street life. When asked about how to move the scene forward in Mbale, he remarked, “We need better recording studios in Mbale: there is having music but the quality also matters.” Besides, the quality of the sound, there is the test of contextual relevance and one wonders whether the part-time infusion of Japadhola lyrics will endear fans to a second-hand sound passed on from a street context that is culturally alien to theirs. At the festival, the crowd appeared undecided, shuffling between the view of the stage and a projector at the street flanks where a World Cup game was being aired. On stage, Ajambo Babie, Rexy and Skin Tosh in sequence, performed to the loitering crowd. However, Kadongo Kamu veteran Ronald Sebale, a fitting climax to the evening, ignited the reluctant passions of festival goers emptying the bars as the crowd snuggled closer to the stage for the final act. Regrettably, Mdibalekela’s wish is a departure from Bayimba’s intended formula of presenting only the most impressive and memorable acts from its regional circuit on its September grand showcase in Kampala. But specifically, Mbale is a multi-ethnic society gathering most of its influences from Kampala; it is unlikely that what fails to impress Mbale would impress in Kampala. 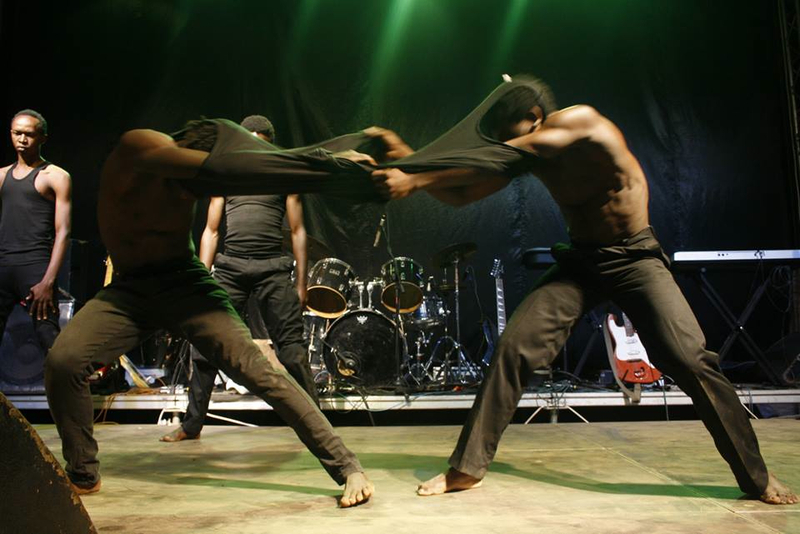 In comparison to previous editions in the region, the 2014 Bayimba regional festival in Mbale showed that while its people love their artists, they expect the festival to be an exhibition of the most popular. To fulfil Bayimba’s intent to showcase the best of what regions produce at its regionals, more scouting and training will be required for Mbale’s artists to compete with popular influences from Kampala. Most importantly to realise this aspiration, the Mbale artist must match the challenging audience. Rather than bemoan the circumstances, the Mbale artist must elevate their craft as a reply his apathetic audience.